About Murray & Sons Inc! Here at Murray & Sons Inc, we are a family owned business with a mission to proudly serve the citizens of the Northeast Arkansas area. 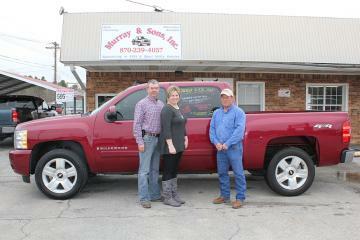 Owned and operated by Kerry Murray Troy Foster, this team is dedicated to customer service! We want to sell you trucks and SUVs for a lifetime! It is our goal to have an outstanding selection of dependable, used trucks and SUVs that will fit a variety of needs. We understand that bad things can happen to good people; that's why we are committed to ensuring that all our used vehicles are in tip-top shape and pass a rigorous inspection test by our service team. Regardless of your financial situation, we are here to try to help get you the vehicle you need and the credit you deserve!